I thought I’d share something with you guys (and gals) about an experiment I have started. This experiment involves a brand new app / script I have developed that build FULL websites at lightening speed, on autopilot. I simply paste in a list of keword phrases, select the category on my site and click ‘Build Pages!’ and the script will go and build the webpages complete with articles, videos and resources. All relevant and useful information. You see, although I have a couple of stagnent sites that have a few Adsense ads on I have never delved into ‘the Adsense thing’. I do know of one or two people personally that have done VERY well with Adsense sites. I’m talking thousands of dollars per month and one of these guys had about 500+ Adsense sites all bringing in money each day in clicks. I have been pondering recently about which would be the fastest possible way of bulding a full website which would involve VERY little work. As in for me to populate a site with lots of content. I then decided to write a script that done just that. The results are great. It does work in 10 minutes that would probably take me two weeks manually to do. Anyway, I have just setup my first two Adsense sites. The one which I am going to talk about now is www.freeweddinginformation.com . I used my SEO Toolbox v2 to find me an available domain name without hyphens where the phrase got some traffic. Granted, it’s not a HUGE traffic keyword but for my intial experiments it was ideal. I whipped up a site yesterday for it using my script. I spent about 15 minutes using Googles keyword tool in my own specific way to get my keyword phrases. I then pasted them 5 at a time into my app and clicked ‘Build Pages!’. About 5 – 10 minutes later te site was built. The next stage was to get this site indexed in Google. All I done was add the link to my WF signature link with the anchor text ‘5’. This is jus a temporary link for indexing purposes. As well as that I bookmarked the site on Propeller and Stumbleupon. I done that last night and this morning, not only has the site been picked up, Google has indexed 19 pages so far. Not a bad result. I have included a couple of screen shots below for you to look at. I will be conducting this experiment over the next few months to see how much, if any, each of these sites can make. I will also show in great detail what I have done to achieve this. I cannot gaurantee that this experiment will be successfull. All I can do is run with it, and then share my results with you. I will also be tweaking different things with each site to test out various things such as ad placement, colours, site structure etc. I will also then share with you the best methods I have found to make the most money from your sites. With regards to this site building script, for now I will not be sharing this as I am using it for my experiments. However, at some point I may decide to turn this into a real product so you guys (and gals) can get hold of it if you choose to do so. That is of course if this experiment proves to be successful. Another site I have just set up using this script is www.cabbage-soup-diet.co.uk (note the difference in domain structure and extension – All part of the experiment). I hope you all follow me on my journey to see how all this turns out. Nice case study Andy, thanks for making it free. Hey, thanks for pointing that out Iain. I have changed that now so people should be able to see the site. Hi Roland, thanks for your comment. Well yes, that is what this experiment is all about. It may be that the outcome isn’t good. It may be that I can find a good, easy way to earn passive income. Time will tell. Al I can do is run with this experiement and share my findings, good or bad. So far though it’s not bad although it is very early days. Thanks for this Andy. It’ll be very interesting and I’m going to attempt to subscribe to the rss 2.0 to get all responses for this post! Very COol! Any idea where can I find the tools and also the template you are using for your adsense site? Hi Winson, the tool is my own. It’s at the early stages and will be developed over time. I will decide what to do with the tool after the experiment. The template is one I knocked up but will be altered on different sites as go along. Just had a good look at the sites and I will be very interested to see how well the black adsense goes – I wouldn’t have thought it would work well with black …but we’ll see. This is a really useful challenge Andy – again thanks a lot for doing it. Hi Mandy, the black and white is part of the experiment. I’m going to be testing all kinds including different colour themes to see which yields the best clickthrough rates. Sorry to keep making comments, but this is just a question to you actually so doesn’t need to be published: can you email through to us who are on your list, whenever you publish results? That would be really cool. This is awesome Andy. This experiment is interesting and the product you are using to get the result will be a hot cake for even those who are not into adsense. This looks very interesting. Almost “too good to be true”. I will follow. Also, there are quite a few typos in your post. *** Thanks Becky. Regarding the trypos (lol.. that one was done on purpose!) I should have read the post thoroughly before publishing it. I wanted to get this out to you all to read but am REALLY pushed for time. Working on a new app which I’m wanting to finish of shortly. When I get chance I’ll go through and edit them. It may also be down to me having a new laptop which I bought about a week ago. The keys feel different when typig so I need to slow down a little and get used to it. Lol. Sorry, but this is nonsense. The site looks crappy and is full of advertising. If I found it through Google, I would click away within secondes. The design is corrupted in FF and the content has nothing of value. I am pretty curious if you can make any money of it, I don’t think so. *** Hi Phil, thanks for your comment. As I have explained in my post, this is purely an experiment. Lots of things will be tested throughout the next few months, including content, colour themes, site structure, ad placement, affiliate products etc, unique content, content pulled from vaious sources etc. Tests will also include sites that have LESS advertising on them to monitor bounce rates. As for the broken template, that is actually due to the split graphic near the footer. I can alter this. This WHOLE thing is only a test to see what elements and options work best. Things will change a lot through the experiment. Hopefully this case study will benefit those that follow it, even if you choose not too. Thanks again for your comment anyway. Exactly the strategie I’m using (typical niche marketing) BUT also to promote local companies. Seems good even as there are actually less than 70,000 competing websites it is impressive. However this could be just down to the fact that there is no search volume. Will be very interested in the cabage soup domain as that has real traffic. Anyway all the best and hopefully i will keep getting the emails with the updates. Hi Mark, sorry I was meant to include some other stats within the post and forgot. Competing pages: Broad = 51,900,000 Phrase Match = 69,800 Intitle Match = 2,750. The monthly search volume, exact match according to Google is around the 580 per month mark which isn’t much, but then I do not want to target a super competitive keyword with this site. I’ll be testing different ‘search volume’ keyword phrases with each site as we go along. This stuff looks great. Really will be taking a close look at these results. I hope at some point you could make this site builder available. Building these websites in my opinion is a great idea as multiple of such sites would generate a good amount of income. Look forward to the regular updates and let me know if there is any testing etc from different servers browsers that need to be done! Interesting post. I know that there is a lot of auto-blogging software out there, particularly for WP. I’ve tried a couple but without great success, a lot of which I’ve put down to Google not wanting to rank the same article twice (not a duplicate penalty as such, just not rewarding a site for having content that’s already indexed elsewhere). I note that you’ve taken content from Ezine articles, and it clearly hasn’t done your site any harm. It may not bring lots of traffic, but for the purposes of the experiment it’s reasonably competitive, so I am intrigued as to how it’s ranked so highly so quickly. Look forward to following the experiment. Hi Dan. I believe most autoblogging tools pull one article. My script pulls content from various resources for every page. So, each page isn’t a ‘carbon copy’ of other sites (minus the headers, css and tags). The idea behind this is to see if Google, plus other search engines see’s these sites as a good resource for each pages keyword phrase. This is the core of the experiment. no reason for people to blast you for trying to help us by finding out what does or does not work. Keep up the excellent work and I look forward to following the results. Hi Andy, great stuff. Where do I get hold of a copy of your script? Hi Andy. I just looked at your two sites. The adsense ads are in the right place. The upper left corner is considered a hot zone. Here’s the however. However, the concept is not new. The videos on the side is a nice touch. The articles are clean; I ran the wedding site by “CopyScape”. This is a big plus! With good content and SEO I think you may just have something that will fly. Your case study looks interesting and I’m impressed. I look forward to more results. btw love your Easy Article Rewriter. So once you set up a site, it’s pretty much set it up and forget it? It will update itself through RSS feeds? Keep us updated. I will be trying different linking strateies with different sites. With these first two I will do a bit of gradual link building and bookmarking. Others I will build a few links then leave them. Others I’ll build on an ongoing basis. The end result though is to look for the best way in which to earn passive income with the least amount of work, then replicate it quickly and easily. Nice idea Andy! I’ve been looking at an automatic site builder in the last few days – it’s called Automatic Website Builder by a bloke called Mindaugus – sometimes known as AdsenseBoy. Know anything about it or him? It looks good but costs about £109!! Also is built on his own platform ans not on WordPress. Hi Andy – I think the cabbage soup site looks very cool and far better that a lot of the MFA sites out there. Please do keep those of us on your mailing list up to date on your results. Yes, that site is going to be subject to the google dance and should disappear into obscurity at some point shortly. Of course, it all depends on the keywords. If it Happens to be “pumpernickle poopy”, you might just stay there forever. I am expecting them to jump around a bit and maybe also disappear from the index for a few days. I’m just waiting to see how they come back and how they rank afterwards. To be fair though. All sites go through this when made live. It’s about earning a little each day with each site – for the long term. If the sites disappear and don’t come back then that’s fine and my experiment will draw to a close after trying out some additional things first. At least man of you will know the outcome, even IF it is bleak. interesting, however alot of new sites jump to the top of google then fall off after a week or two. Should be interesting to see what happens! Maybe a FTC complaine, just to be sure and covering all angles. I must say, the sites look very nice, clean and modern! Is there an option to get your own original articles on the site instead of generated content from the software? *** Yes, good point. Lesley Johnston whom I’m running this project with has already pointed his out to me so I just need to implement something within the template. As for your question, yes, this is the next stage. With the end product you’ll be able to add your own content as well as choose what content and from which sources you pull from. You’ll be able to build your sites the way in which you want to. Again, we’re just starting with the initial concept and we will develop this over time. Funny timing of this post. I was just searching around for something that will do this very thing! Mike Steup has a product called Article Writer Pro that looks like it does the same thing. Is what you are using different than that? Funny that. My first product is called Article Writer Pro. No, never heard of it. Mine isn’t the same one. I wrote this from scratch to build sites without having to go find and collate relevant content. Not sure what his product is. Hi Bruce, the site is still ranked at 5 at my end. I am expecting it to drop and disappear for a bit. I’m not after a mad rush of traffic straight away with this. I’m trying to build up over a bit of time and try and get the site stable within the SERPS. That term does seen to have low traffic and very little true competition. So getting on page one would not normally take too long. I have no comments to make about the colours used, where ads are placed etc because these can be tested and changed. My concern is that you will just not get that much traffic to make it really meaningful. Maybe you will get traffic for the other terms or site categories. If this exercise is to test a website building script of some kind then it could be interesting. Either way, I wish you luck and thank you for sharing this test with us. Thanks for the comment Steve. Yes, it is test everything. Remember, this is only one site. I will proably be testing across a number of domains and keyword phrase. All I’m wanting to see for now is how Google treats these pages say 4 – 6 weeks down the line. If they remain in Googles index then the site can be worked with. Love the testing. These are the exact kind of websites I create. The automated site builder is very impressive and looking at them I believe there could be a high CTR. Just something that might add value and keep people on the pages is more images or videos. I think I read it ads videos and this would be excellent. If your looking for anyone to test it, I have many free keyword domains! The real test will be if you can hold any rankings beyond the first indexing which almost always looks good. I’m not a fan of packages like this that promise no work. Plus the fact that you’ll be leaving footprints with any package deal unless there’s a miracle of some sort. I guess we’ll see though..
I’ve not promised that anything will work. This is just a test. That’s all. As for footprints, how would this leave a footprint. There are lots of templates, platforms etc that are the same but with different content. Also, the structure and css element names could be changed with each site if required. How much of this is the result of highly a the exact keyword domain match. I noticed in your previous post you had showed how this is clearly a benefit and that google gives good rankings for having the keyword in your domain. *** Yes, it does Anthony. I think that keyword rich domains do play a role providing all else is in place. If you get an aged domain that is exact match then that will hold a lot of strength. An offline niche that I have, (promotional products), the top ranking sites for ‘promotional pens’ have absolutely thousands of backlinks to ALL their categotories and pages so is a competitive niche. A guy who I know of bought the exact match .co.uk name years ago and has just sat on it, along with many other domains. He set up a site a while back and let it go live. It went straight up to no.1 with very very few links. He is obviously building those links up now but I have seen far too many times the power of keyword rich domain names. All I’m tying to do first is get a site indexed to see how Google treats these pages once it has taken a good look at them. Then build the content up, add some links (gradually!) and see how we go from there. If this works then I will be setting up a large number of sites, all with different tweaks so I can test which things work best. I’m basically trying to find the best methods so I can create a ‘blueprint’. Once I nail it I will be using the latest ‘version’ of my script to build more sites. Some people are hammering me for all this but all I’m doing is creating a public experiment. Even I don’t know the outcome. I’m not relying on this to make money. It’s just a chance to test out different things. Will be waiting for results. Sorry Andy, It appears that http://www.freeweddinginformation.com has disappeared from the first few pages, for the search “free wedding information”, in fact it does not appeared to be indexed??? Is this the renowned “newbie site” dream ranking on Google? or a hang-over from a previous ranking for the site? The “site: ” test does not find the home page? This is completely normal for this to happen if it has in fact disappeared from the index. Site can do this especially soon after being crawled and indexed. Google will be evaluating the site which is what I want it to do. Don’t worry, this is early days. Do I understand correctly that the sites you’re building with that amazing tool are uniquely to carry AdSense ads as opposed to original content ? Hi Bryan, well the sites essentially will be monetized in some way. These may include Adsense, other types of ads, affiliate products etc. Everything will be tested if I get past the first hurdle. Obviously, the idea behind this is to produce sites that make money. This can be anything from $1 per day upwards. Once we create a winning formula it’s a case of ‘rinse and repeat’ BUT we have to get that winning forumula first. I am a happy customer of one of your products. About your blog post today, I’m really impressed with the short indexing times. I was just looking, and some of the pages were just indexed in the last 4 hours. To what do you attribute your fast indexing times? Thanks for your help and generosity. Hi Syd, thanks for your comments. The indexing was just down to adding a link to my WF signature and ookmarking at the two places stated in my post. This looks very interesting! I am new in IM, take me a long time to build a website. I will follow your experiment and see the result! Perhaps the quick indexing of the freeweddinginformation.com site was related to the URL being a dropped site (June 2009???). In similar experiments I have noticed that “dropped URL’s” often have retained their Google index and ranking which provides a ‘dream run’ in getting new pages indexed, but the bot eventually catches up and PR rating and site score takes over. Dropped URL’s also have the advantage of having a longer ‘age’ which helps ranking. Hey John. Thanks for your comment. I wasn’t aware about this being a dropped domain. I just stumbled across it using Googles keyword tool and my SEO Toolbox. I don’t think the quick indexing was down to that as I’ve never waited for more than 24hrs to get a site indexed and I also got my cabbage soup diet domain indexed quickly. Not sure if that is a dropped domain too though. Maybe you are right about the high-ish initial ranking though. That could make sense although June was over 6 months ago. Could be though,well spotted! Perhaps the ‘proof is in the pudding (soup? )’ – cabbage-soup-diet.co.uk appears to be a new URL (sept 2009) and the home page is indexed – but none of the sub-pages. This site does not appear in the results for the first few pages of a Google search “cabbage soup diet”. Maybe the good result with the other site is due to it being a dropped site. I also believe that a dropped site retains the links it originally had and this may help ranking and indexing. I think there are many advantages in using dropped sites – anyone have info on this? You may have a point there John. As for the cabbage soup diet one, I wouldn’t expect too much weight from that domain name just yet. I think exact match domains hold more weight, particularly non hyphenated. I will go and check now to see if my wedding domain already has any backlinks. I use your article rewriter all the time on my 2 websites. If you need a beta tester for this thats still kinda,maybe a newbie,im in. Could use all the help i can get. Great job on the index checker. Your site building tool could be a winner Andy. The difference in the rankings for the two sites may be due to a difference in the competitiveness of the main search terms. Any updates to share with us Andy? GeorgR. from warrior forum here. This is interesting, but site builders are nothing new. This goes way, way back to YACG or whatever other scripts out there. If i’d feel up to it i could get a half a dozen site builder scripts right now. My question is where your script is different, and what the main criteria FOR THE RANKING is. It cannot be simply scraping content like the zillions of autoblogs out there (i myself have a bunch of them also). Hi George, I agree. It’s not a new concept. I’m just looking at delving into this to see if it does work (in the long run) or whether it falls on its face. For now, I am just letting the sites sit for a while. 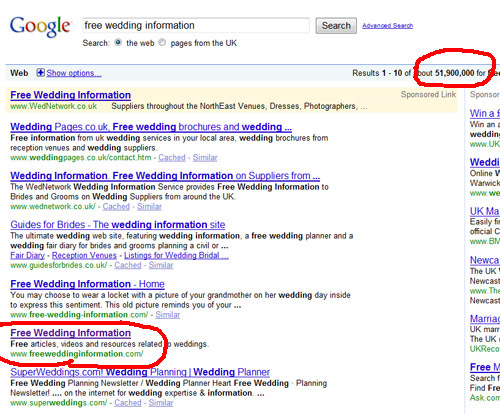 Google has indexed the pages although I made some changes to the Wedding site structure which had some strange results. I have put these changes back and the pages are being indexed again. The cabbage soup site currently has 71 pages indexed in Google which should be near enough all of them. I will start a bit of link building a little down the line and put a plan into place. The inner pages do rank although not very well.. 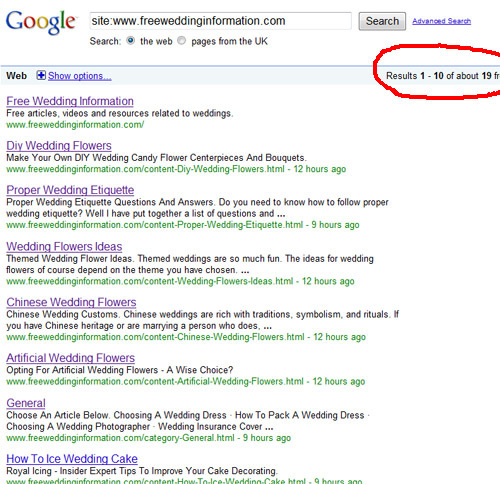 BUT they are still being returned within the SERPS which is a positive sign. If I see some positive results after some linking I will look into developing the script so that it works with the content and pulls various different content from other sources. It’s just a work in progress, but right now isn’t at the top of my priorities. We’ll see how it goes though. it’s so useful info, very interesting. great job andy! Please see my latest post in this category. that is good for you. Can you let us know more about that script? I would like to have it.